"That place sounds like a library!" "You can hear a pin drop!" "Corporate Consol!" Log on Twitter for about fifteen minutes during a Penguins game and I guarantee you will see at least one variation of those words. Penguins fans are often criticized for a lack of crowd noise at Consol Energy Center for home games. I'll admit, this criticism may be warranted. Quite often the building seems disinterested and disengaged from the play on the ice. Sure, we'd all love a ruckus crowd that's always screaming and waiting to explode. 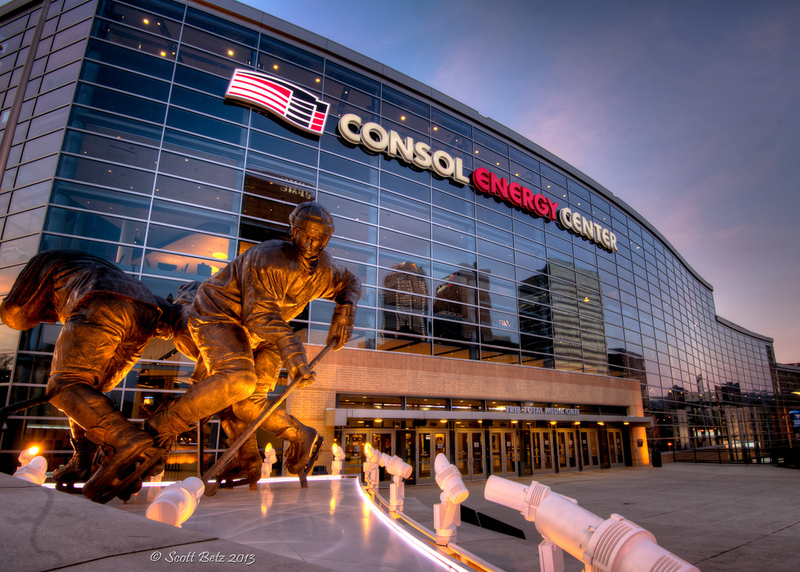 But unfortunately, that's just not the trademark of the Pittsburgh Penguins since moving to the Consol Energy Center. That is mostly due to the design differences of the two buildings. The Mellon Arena the hard dome shaped roof acted like a satellite dish utilizing the parabolic share to gather sound waves and direct them off the ceiling and back down. Not only that, but the cantilever based construction type allowed for a more intimate experience and for the fans to be "closer" to the action allowing a shorter distance for sound to travel. [For more information on how this works, check out Sports Science on ESPN] But that is a topic for another post on another day. The Penguins have become a family-based franchise. Everything the Penguins do is family oriented in some way. Sure, it limits the rowdiness inside the building, but thi$ i$ a $uperb bu$iness $trategy. Management isn't dumb, they know exactly what they are doing. Despite the lack of crowd noise, I'm not sure it matters that much. Like I said, sure it'd be nice to have a boisterous crowd but at the end of the day the crowd isn't going to win you a game. I can't criticize the "corporate" folks either. They paid for the tickets, they can do whatever they want. The fact is, Penguins gear and tickets are selling like hotcakes still. This team will spend right up to the salary cap and will continue to challenge. With or without crowd noise. Hockey isn't like football where you can draw opposing defenses offsides with crowd noise. The game itself doesn't allow for this type of "fan intervention." Because hockey is always in continuous motion, this does not allow for players to pause and think about the noise. In football, they pause after every play and have to listen to the snap count and watch for movement. Hockey, the most a boisterous crowd would influence could be that a player doesn't hear his goalkeeper telling him to either play it behind or up the wall. This is not to say that crowds can never influence hockey, just that it's importance is a bit overinflated. The lack of crowd noise has been an 'issue' for a while now. But has it? Over the last 5 years, the Penguins have amassed a record of 103-42-10. Not to shabby for a team that lacks the true home ice advantage. Conversely, the Winnipeg Jets widely considered to have some of the best and most active fans had a nearly identical home record as the Penguins. Does this mean that you aren't allowed to want the fans at Consol to be loud, obnoxious, and passionate? Absolutely not. I enjoy games where the fans are engaged as much as the next hockey fan. I'm just implying that it doesn't mean much in the grand scheme of things. Just remember. If you are at the games want the crowd to be loud, do something about it. [Whooo-ing doesn't count] You have the power.